*** #1 The Sunday Times bestseller*** Publishers Weekly bestseller"This book is no joke. Get ready to not sleep tonight. 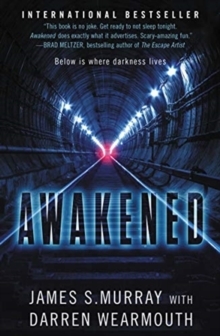 Awakened does exactly what it advertises. Scary amazing fun." -- Brad Meltzer, bestselling author of The Escape Artist. "Awakened hits the high notes of Douglas Preston & Lincoln Child's Relic and Scott Snyder's The Wake [...] but its scope actually extends much further." -- Kirkus ***The star of truTV's hit show Impractical Jokers-alongside veteran sci-fi and horror writer Darren Wearmouth-delivers a chilling and wickedly fun supernatural novel in the vein of The Strain, in which a beautiful new subway line in New York City unearths an ancient dark horror that threatens the city's utter destruction and the balance of civilization itself. After years of waiting, New York's newest subway line is finally ready, an express train that connects the city with the burgeoning communities across the Hudson River. The shining jewel of this state-of-the-art line is a breathtaking visitors' pavilion beneath the river. Major dignitaries, including New York City's Mayor and the President of the United States, are in attendance for the inaugural run, as the first train slowly pulls in. Under the station's bright ceiling lights, the shiny silver cars gleam. But as the train comes closer into view, a far different scene becomes visible. All the train's cars are empty. All the cars' interiors are drenched in blood. As chaos descends, all those in the pavilion scramble to get out. But the horror is only beginning. High levels of deadly methane fill the tunnels. The structure begins to flood. For those who don't drown, choke or spark an explosion, another terrifying danger awaits-the thing that killed all those people on the train. It's out there...and it's coming. There's something living beneath New York City, and it's not happy we've woken it up.